Without a doubt, Augmented Reality has captured my attention this year in a big way. I've blogged about AR Business Cards, an AR Museum Guide, AR Games and even an AR Music Video. For me, Augmented Reality technology represents the first major technological convergence with serious potential for both entertainment and real world application. So here I present to you the most cutting edge use of Augmented Reality I've seen to date - Augmented Reality Contact Lenses. Our eyes are one of the most astonishing organs in our body. They allow us to see millions of colours, seamlessly adjust between shifting light conditions, and they can transmit all this information to your brain at a faster speed then your broadband internet connection. Your retina has a static contrast ratio of approximately 100:1, however your is capable of adjusting its exposure both chemically and by the iris. In this way your eye can achieve a dynamic contrast ratio of about 1,000,000:1. Even more phenomenal is that the process is non-linear and multifaceted, so even if your field of vision is exposed to bright light, the process simply starts again, without any ill-effect. So what if you could do even better? What if you could augmented this incredible organ? Imagine a world akin to the novels of Vernor Vinge, in which characters utilise contact lenses that allow them to access global information banks through graphic interfaces right before their eyes. 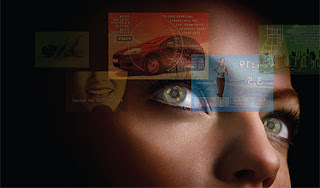 This is the world of Augmented Reality Contact Lenses, and it's a world that may not be too far away. Consider what would be necessary to achieve such technologies - microelectronics, nanocomputers, transparent synthetic conductors. The truth is, these things are not science-fiction and are already being not only developed, but tested, in labs around the world. One such lab at the University of Washington is at the forefront of what may be the next giant leap in mobile computing. 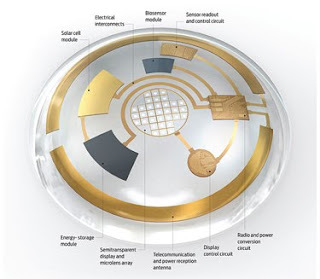 Admittedly the lenses that they have so far developed are quite limited, but they have achieved building a lens with a micro-LED powered wirelessly through RF. 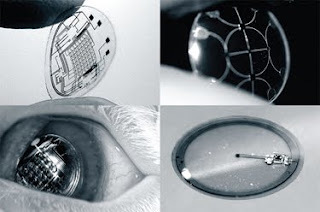 The team there are taking conventional contact lenses and turning them into functional AR systems with integrated control circuits, communication circuits, and miniature antennas. there next step will eventually be to include hundreds of LEDs, which will form images in front of your eyes. These could be anything from words to photographs. So how close are we? Well, I may have exaggerated slightly, being able to pop in your AR Contact Lenses that allow you to fully access the web is a bit of a way off. Don't despair though, there are a number of extremely practical applications that are likely to happen long before that. Firstly, the technology does have the potential to provide vision enhancement to those that suffer from vision impairments, and it could even act as a simple warning system for those that are hearing impaired giving directional information about loud noises etc. Of course in the beginning the most likely situation is that the display and interface lenses will rely on a wearable portable-device that would feed the actual information through to the lenses. Anyway, this is seriously exciting stuff in my opinion both in the short term and long term.